Section and chapter headings: Preface. Spatial/Temporal Frequency Processing. Hemispheric Asymmetry in the Processing of Spatial Frequency: Experiments Using Gratings and Bandpass Filtering (S. Christman). Temporal Frequency Processing (L. Mecacci). Interhemispheric Transfer of Spatial and Temporal Frequency Information (N. Berardi, A. Fiorentini). Object and Spatial Representation. Hemispheric Asymmetry for Components of Spatial Processing (J. Helige). Computational Analyses and Hemispheric Asymmetries in Visual-Form Recognition (C. Marsolek, E.D. Burgund). Visual Attention. Amplification of Spatial Nonuniformities by Guided Search Mechanisms (E.W. Yung). Hemispheric Coordination of Spatial Attention (J. Enns, A. Kingstone). Asymmetries in the Flanker Compatibility Effect (F. Kitterle et al.). Effects of Visual Field Locus. The Relation Between Left-Right and Upper-Lower Visual Field Asymmetries (S. Christman, C. Niebauer). Auditory Processing. Hemispheric Specialization of Human Auditory Processing: Perception of Speech and Musical Sounds (R. Zatorre). Perceptual and Cognitive Development: Electrophysiological Correlates (D. Molfese, D. Narter). The Ipsilateral Auditory Pathway: A Psychobiological Perspective (K. Hutson). Tactual Processing. Role of Sensory and Post-sensory Factors in Hemispheric Asymmetries in Tactual Perception (J. Fagot et al.). Olfactory Processing. Laterality in Human Nasal Chemoreception (R. Doty et al.). Name Index. Subject Index. The purpose of the book is to provide a comprehensive overview of hemispheric differences in sensory and perceptual processing. The first section of the book deals directly with the intra- and inter-hemispheric processing of spatial and temporal frequencies in the visual modality. 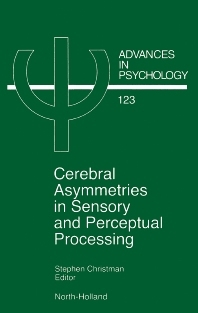 The second section addresses the initial interaction between sensory and cognitive mechanisms, dealing with how the left and right cerebral hemispheres differ in their computation and representation of sensory information. The third section covers how attentional mechanisms modulate the nature of perceptual processing in the cerebral hemispheres. Section four consists of a single chapter which reviews evidence suggesting a functional linkage between upper and right visual field processing, on the one hand, and lower and left visual field processing on the other.